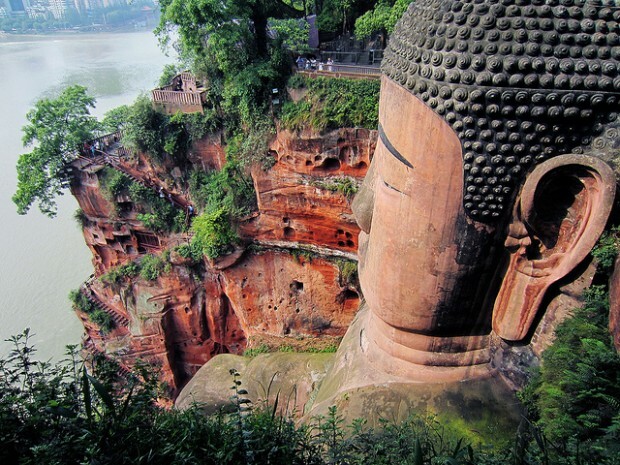 The Leshan Giant Buddha is one of the most biggest and most beautiful statue from all over the world. It is situated near the city of Leshan in China. China is a sovereign state located in East Asia. With a population of over 1.35 billion of people, China is the world’s most populous country. By land area China is at the second place with a 9.6 million square kilometers. Landscapes in China are vast and diverse. There you can enjoy in the awesome forest steppes, beautiful deserts and subtropical forests. The Yangtze river is the third largest river in the world. If you want to explore some new places and at the same time you are lovers of incredible stone statues, then we suggest to go to China and visit the world’s largest stone statue of buddha – The Leshan Giant Buddha. In this article you can see some incredible pictures of Leshan Giant Buddha that will gonna blow your mind. This statue is a prove that people are very smart and can create whatever they wants. These beautiful photos will gonna make you feel like you are in front of the statue and enjoy in the beauty. Also these pics will gonna make you to wish to visit Leshan Giant Buddha statue one day in your life. The height of the statue is 71-meters (233 ft). It is the most unusual stone sculpture. Leshan Giant Buddha was built in time of the Tang Dynasty. Leshan Giant Buddha is the largest stone Buddha in the world.